The statue is the centrepiece of your home altar plans. 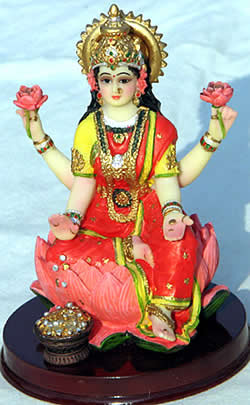 Here is a resin statue of Our Mother God as Sri Lakshmi, Creatrix and giver of worldly and spiritual blessings. Home altar plans: the domestic shrine is central to the worship of Our Mother God. Goddess shrines and shrines to Our Lady Mary are found all over the world. Here we discuss the creation of your own home shrine. Traditionally, the home is a sacred place. Every Déanist home is a Temple of Hestia. The centre of that home is the Home Shrine or Domestic Altar. As devotees of Our Mother God in a patriarchal world with a long patriarchal history, we have no Churches or Temples dedicated purely to Our Dear Lady, but we can follow the ancient tradition of making our own Home Shrines. When we begin making our home altar plans, what do we require? A home shrine can be a whole room set side for devotion and contemplation or a small table in a corner of a bedroom. The altar itself can be any table or even a shelf. The style can range from austere and pure to opulent in reds, golds and other rich colours. It will often be covered by a cloth that reflects its style and colour-scheme. Central to any altar is the statue. This is a representation of Dea in the form(s) in which we worship Her. 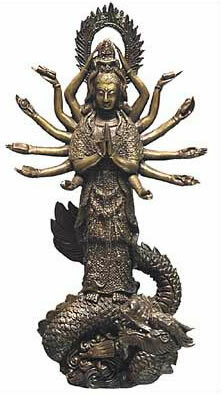 It may be a statue of Kuan Yin, Sri Lakshmi, Tara, Our Lady Mary or any other Form of Dea. We recommend images from living traditions as the central altar-piece rather than "pagan" or extremely ancient images for reasons explained here. However, "pagan" images as supporting figures representing the Angelic Powers of Dea are wholly acceptable. 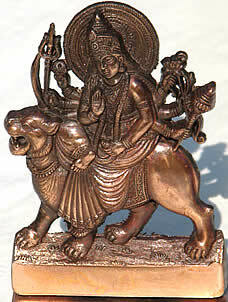 You may, for example, want a protecting figure of Our Lady as Sai Vikhë (Her Martial angel or aspect). This could be an image of Durga (which, as a living Image of Dea could also be the centre-piece) or a statue of armed Athene, which we recommend should be placed in a supporting position. What sort of statue should you consider when making your home altar plans? Much depends on your personal spiritual leanings. A rare and precious antique statue of Kuan Yin could be a lovely object of devotion, sanctified by years of loving use and reverent service. Alternatively, there are some beautiful reproductions available, carefully and accurately made to traditional canonical specifications (see our page on the Kuan Yin Royal Ease position for more on canonical imagery). At the more modest end of the market are lovely resin statues of Sri Lakshmi or Our Lady Mary. These are often a little sentimental, and some people dismiss them as kitsch. If this is how you feel, clearly they would not be suitable to figure in your home altar plans. But in our view these are very sincere devotional statues that have a beauty that shines the brighter because of their devotional simplicity. With a modern, rather than an antique or reproduction statue, the main consideration (other than one's own aesthetic preferences) is to ensure that the iconography is canonically correct. With a small table and a statue, you have the essence of your shrine. When travelling, many devotees carry with them a little image of Dea that may be placed on the bedside table at a hotel or guest room, making a little instant altar for the evening's prayers. Naturally, the small "travelling" Images of Our Lady in Her various forms can also fit into your home altar plans as "supporting" Deity-images – or indeed as the centrepiece of a tiny home altar if you are in circumstances where a larger one would be difficult. 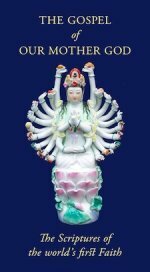 For those who wish to place the Vikhelic or martial/protective aspect of Dea at the centre of their devotions, an image of Durga as shown below makes a fine Protectress for your Home Altar or for devotion and protection on your travels. Those who adore the Thamic aspect of Dea – Sacred Harmony and Order, as well as the Divine Wisdom – a statue of Sri Saraswati in a form of the Royal Ease posture, showing Her as the Ruler of the Cosmic Harmony, is ideal. We hope this page has given you some ideas and some helpful impetus to your home altar plans. We shall be adding more pages of advice on this subject, and please feel free to ask any questions at any time. We are more than happy to help if we can. May Our Lady bless your home altar plans and your home; and, of course, you and your loved ones.